Brendan Frasier made a surprise appearance at New York Comic Con ahead of the world premiere of the TV series Titans to announce updates directly from the set of DC Universe’s Doom Patrol. The actor, who is voicing Robotman in the series and will also star as Cliff Steele in flashbacks, revealed to the eager fans in attendance that Matt Bomer (White Collar) has joined the cast as the voice of Negative Man. Bomer will likewise appear as Larry Trainor in flashback sequences. The actor wasn’t on site at the event, but surprised fans with a special video greeting from the Atlanta-based set. 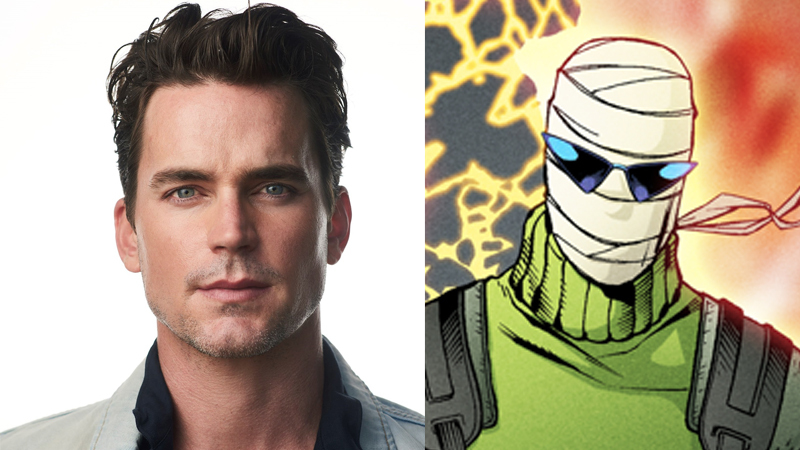 While Bomer will provide the voice of Negative Man, actor Matthew Zuk will provide the physical performance of the character on set in costume, replacing Riley Shanahan, who was previously announced in the role. In the comics, Negative Man, aka Larry Trainor, is a founding member of the Doom Patrol. Trainor was exposed to a radioactive field in the atmosphere while piloting a test plane, which left him radioactive, and gave him the ability to release a negatively charged energy being from his body — or the Negative Man. This being can fly at high speed, cause solid objects to explode, and pass through solid materials. After his accident, Trainor is forced to wear specially treated bandages over his entire body to protect bystanders from his radioactivity. Part support group, part Super Hero team, the Doom Patrol is a band of super-powered freaks who fight for a world that wants nothing to do with them. Picking up after the events of Titans, Doom Patrol will find these reluctant heroes in a place they never expected to be, called to action by none other than Cyborg, who comes to them with a mission hard to refuse, but with warning that is hard to ignore: their lives will never, ever be the same. In addition to Fraser and Bomer, Doom Patrol stars Joivan Wade as Victor Stone/Cyborg, Timothy Dalton as Niles Caulder/The Chief, April Bowlby as Elasti-Woman, Diane Guerrero as Crazy Jane and Alan Tudyk as Mr. Nobody. The Doom Patrol characters will appear in the fifth episode of Berlanti’s DC Universe live-action drama Titans, with Bruno Bichir, April Bowlby, Jack Michaels, and Dwain Murphy starring. The direct-to-series order of 13 episodes will be written by Supernatural‘s Jeremy Carver and will be executive produced by Berlanti, Geoff Johns, Jeremy Carver, and Sarah Schechter.DC Universe recently announced that another live-action series, Swamp Thing, is being developed for the digital service. The series is being executive produced by James Wan (The Conjuring universe, Saw franchise, The Tommyknockers) and will debut in 2019. Berlanti’s other scripted series include: All American, Arrow, Black Lightning, DC’s Legends of Tomorrow, The Flash, Riverdale, Supergirl, Blindspot, God Friended Me, The Red Line, The Chilling Adventures of Sabrina, You, and Titans.